It’s been a long weekend. It was the local Folk festival which meant work was pretty much insane. And my car broke down on friday. So maybe I am not in the best of moods today. So when this popped up on my Facebook friends list I kinda grumped about it. Ok, I maybe having a total sense of humor fail today, but this pissed me off. For one thing, I don’t do this (there was a famous time a freind made me jump playing the first Resident Evil game and I trew the controller across the room though), and second of all I have witnessed male gamers do it just as much as female gamers, especially playing racing games. And I realised over the weekend that even though I now have my PS3 linked to the net I have a fear of joining multiplayer games as my username is obviously female and I have read too much Fat, Ugly or Slutty to dare do it. This entry was posted in Feminism, Gaming and tagged feminism, Gaming, sense of humor fail. Bookmark the permalink. 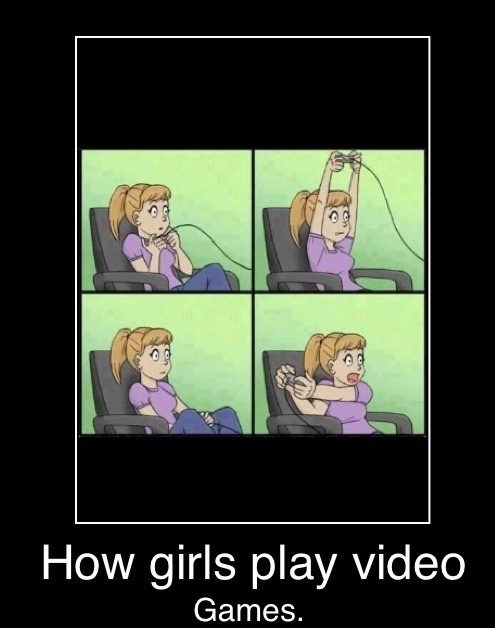 It is sad that this is some stereotype of girl gamers. As have you, I’ve seen lots of male gamers doing the exact same thing. Done it myself.